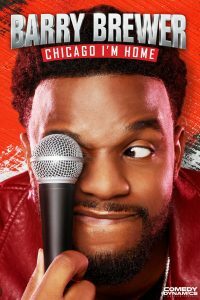 Barry Brewer: Chicago, I’m Home will be released by Comedy Dynamics on February 19, 2019, premiering on iTunes, Google Play, Amazon, Microsoft, Steam, Vimeo, and major cable and satellite providers. Barry Brewer returns to his hometown of Chicago to unleash his hilarious brand of observational comedy to the world. Barry touches on the importance of family and faith while reminiscing on the ups and downs of growing up on the south side of Chicago in his debut stand up comedy special. “I’m so excited to share my debut stand up special with the world! Filming it in Chicago, where it all started for me, was definitely a dream come true!” said Barry Brewer. “Barry’s electric personality and stage presence combined with his relatable sense of humor make Chicago, I’m Home feel like one of those monumental type specials that you simply shouldn’t miss.” said Brian Volk-Weiss, CEO of Comedy Dynamics. Founded by Brian Volk-Weiss, Comedy Dynamics, a Nacelle company, is the largest independent comedy production and distribution company, producing Netflix’s Kevin Hart’s Guide to Black History, Netflix’s The Toys That Made Us, Jim Gaffigan: Noble Ape, The CW’s Discontinued, Animal Planet’s Animal Nation with Anthony Anderson, the scripted comedy on Hulu, There’s… Johnny!, History’s Join Or Die with Craig Ferguson, MTV2’s Wild ’N On Tour, and Hulu’s Coming To The Stage. In 2018, Comedy Dynamics began releasing original films in theaters starting with the acclaimed documentary, Poop Talk. The company has worked with a wide range of established and emerging comedic talent including Tiffany Haddish, Kevin Hart, Aziz Ansari, Jim Gaffigan, Ali Wong and many more. 17 Comedy Dynamics’ releases have been Grammy-nominated, including all 5 in the Comedy Album category for the 61stAnnual Grammy Awards.